“The situation then escalated. Some people had run across the road towards the Chevron property, there was a bit of a commotion, and we saw the protesters run into the property; the surrounding perimeter fences were taken down," Kafanov reports. Local media said people were able to tear down fences to 20 acres of land owned by the company. Riot police officers were called into the area, which made the situation "very heated" as clashes between the demonstrators and the police ensued. "We did see some demonstrators injured, as well as police officers injured. They were taken away in medical vans. We also saw probably about four or five arrests, possibly more, we’re still not confirmed on the numbers," Kafanov says. Following the incident, the US company later announced it was suspending activities in the area. 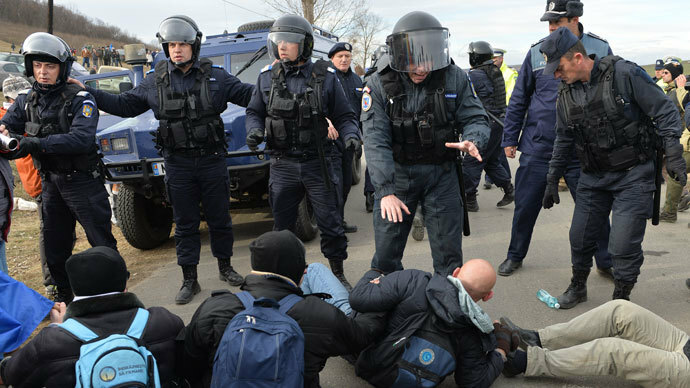 “Chevron can today confirm it has suspended activities in Silistea, Pungesti commune, Vaslui County as a result of unsafe conditions generated by unlawful and violent protester activities,” Chevron said in a statement. The US energy giant has been persistent in conducting its shale gas exploration activities, and less than a week ago, riot police brutally removed a horde of villagers who had been camping out at the site protesting the company’s plan. The site in Pungesti has been the subject of ongoing controversy. The village is believed to be sitting upon vast reserves of the natural resource. Romania may hold 51 trillion cubic feet of shale gas, according to the US Energy Information Administration. 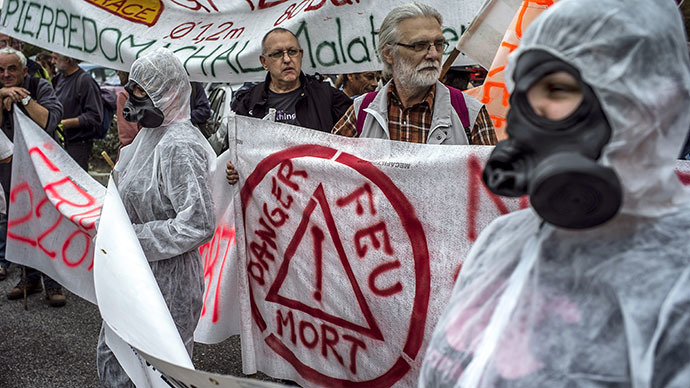 The demonstrators also demanded the resignation of Prime Minister Victor Ponta, according to AFP. Ponta became a strong supporter of the energy source, despite apparent opposition prior to his election. But protesters and environmentalists fear that the hydraulic fracturing, or “fracking,” would be disastrous for the local environment. They say that pumping water and chemicals at high pressure into deep rock formations to free oil or gas could contaminate groundwater. 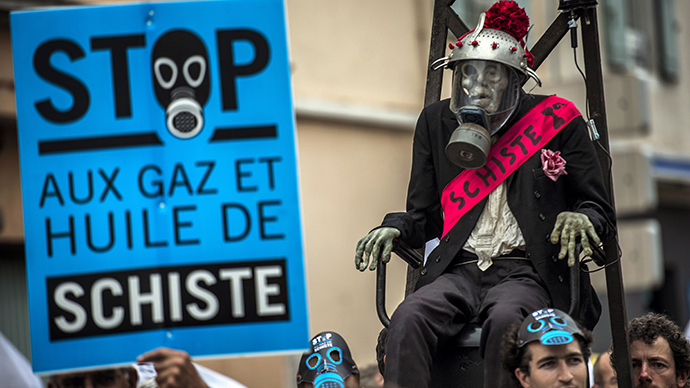 In October, Chevron decided to suspend its drilling plans. To prevent Chevron from resuming the drilling, Pungesti villagers set up a camp in a privately-owned field next to the site where the well was planned to be installed. The camp has been the scene of demonstrations for over a month and a half in total, with thousands rallying across the country in recent months. Pungesti clashes took place between police officers and protesters only the previous week. Outraged participants were as old as 67, according to Kafanov. "There is this very tense climate, and people have a lot of anger…for what’s going on here," said Kafanov. 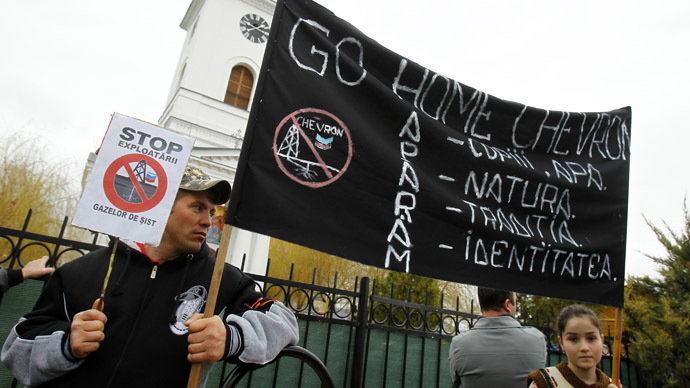 Last month, Chevron filed a civil lawsuit against protesters in Poland who prevented the company from reaching one of its designated fracking sites. The company stated that the protesters had been violating its lawful right of access to one of its four shale gas exploration areas in the country. Protests haven't just been confined to Europe - opposition is spread globally. “The whole industry working on ifs – no definite figures for what gas is down there, there’s no definite promises about any safety procedures – the whole industry’s just shrouded in too many ifs and buts, and that’s really what motivates the protesters across the world ,” anti-fracking campaigner, Andy Chyba, told RT.